1. Location of the site of Gebel Adda. 2. 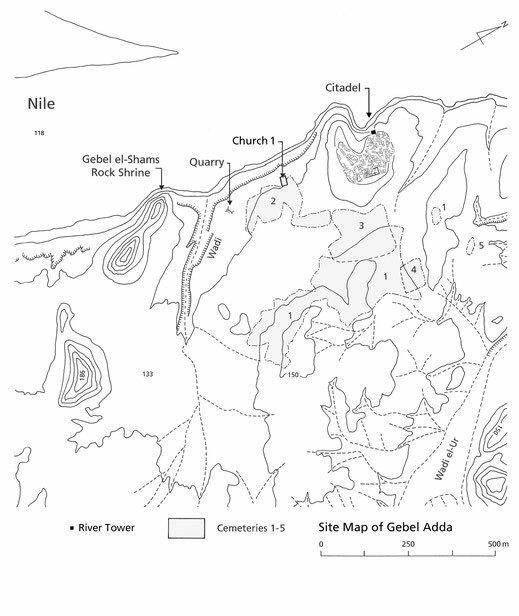 This site map shows the area of our concession, beginning from the ridges of Gebel el-Shams in the south towards the Wadi el-Ur in the north. The position and dimensions of the various Cemeteries 1 - 5 are marked with outlines and numbers. It also shows how the tumuli field of Cemetery 1 overlaps Cemeteries 3 and 4. 1. 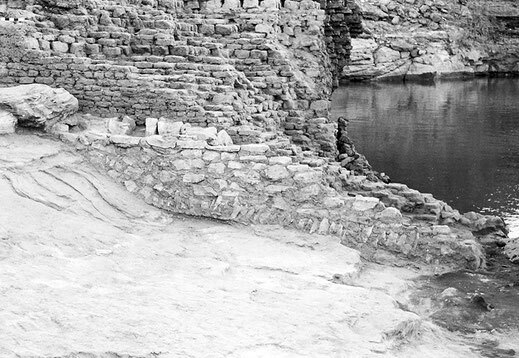 Photograph taken in January 1963: In the front it shows the wadi which ran along the northern flank of Gebel el-Shams. In the background to the left is the Dahabiya "Osiris", our camp site, the Citadel and to the right is part of Cemetery 1 with Double domed superstructures. 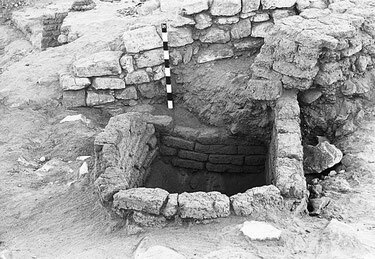 The center of the photograph shows a rectangular mud-brick tomb of a more recent date, probably belonging to a local important person. In the foreground is the Quarry which at this early stage of the season had not been excavated. 2. Tumuli field of Cemetery 1 and Cemetery 3 with Ottoman superstructures. 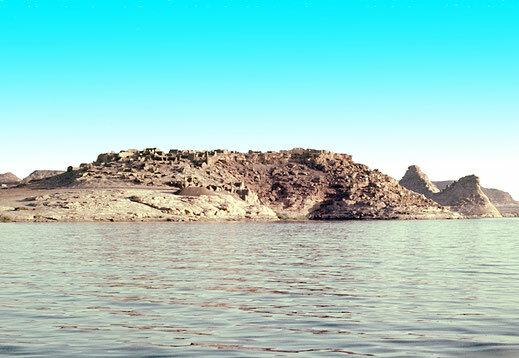 Background with Citadel and to the right the ridge of Abu Oda with the rock shrine of Horemheb. 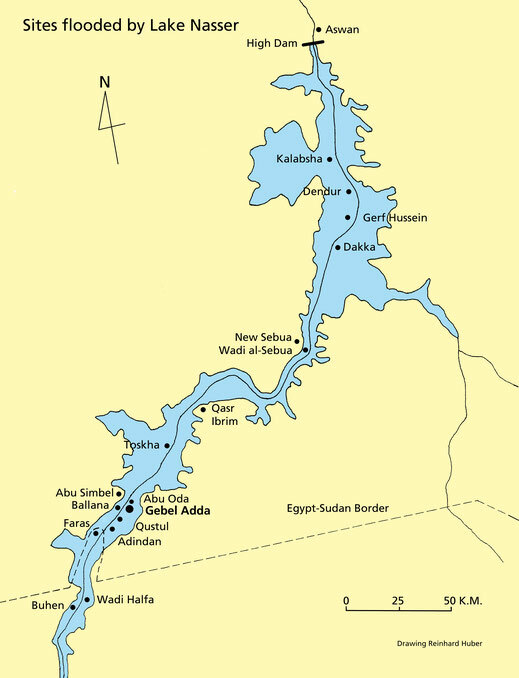 Background: River Nile and village of Ballana. ( photo by Horst Jaritz). 4. 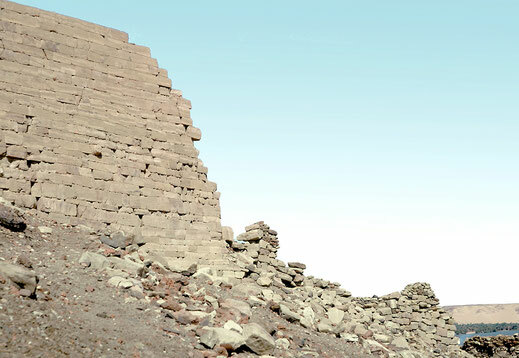 Remains of the collapsed northeastern Meroitic stone wall. 6. 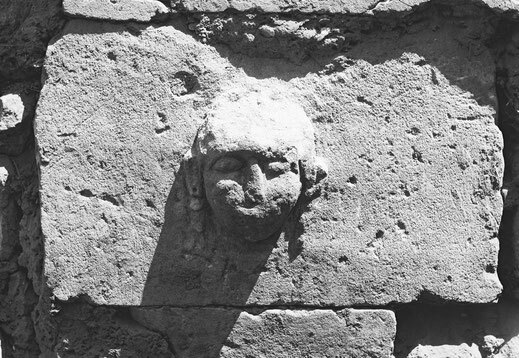 Meroitic stone wall with human head. ( photo by Horst Jaritz ). 8. Second campaign before the flood. General view of the Citadel with the Northwestern Suburb to the left. 3. Looking northwest: Cemetery 1 and Cemetery 3 with Ottoman superstructures. 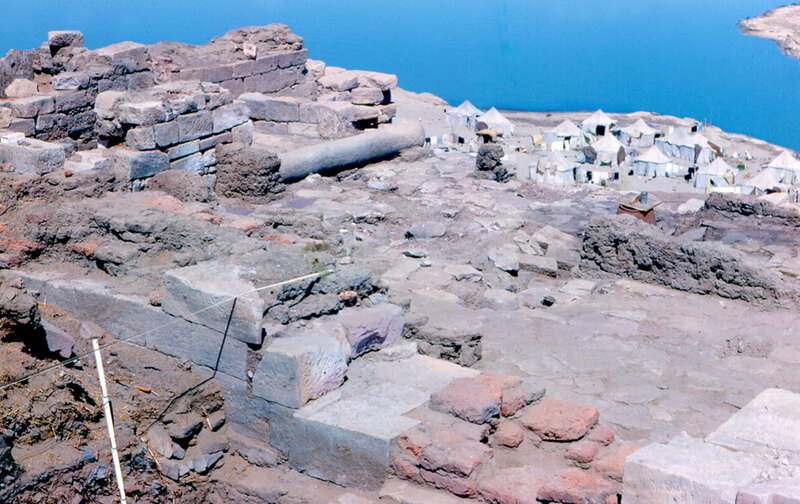 Background: Citadel and the remains of the Meroitic stone wall and the two trial trenches. 5. 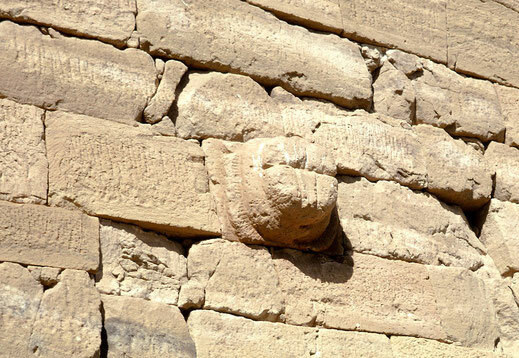 Meroitic stone wall with stylized lions head. 7. 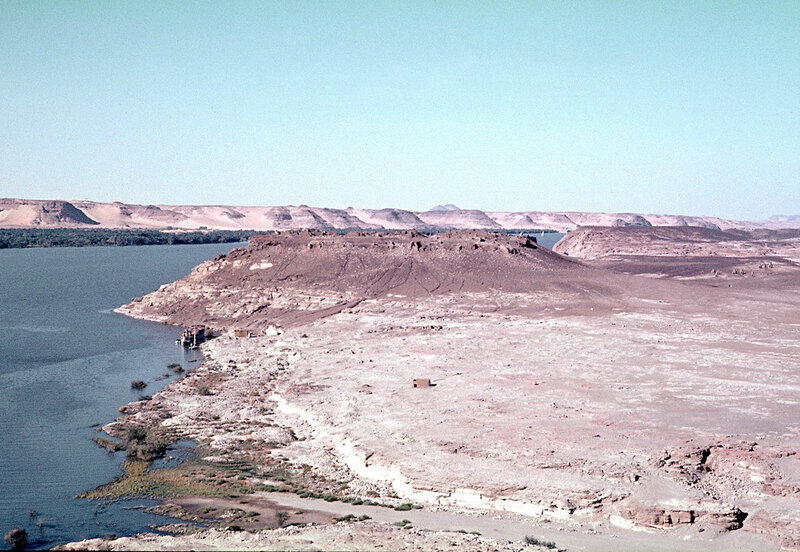 Northwestern part of the Citadel, Behind with River Nile and village of Ballana. 9. Left: Christian House 100, in the center Christian House 100 and 102. The inclined walls of the River Tower where already flooded during the third campaign. 10. 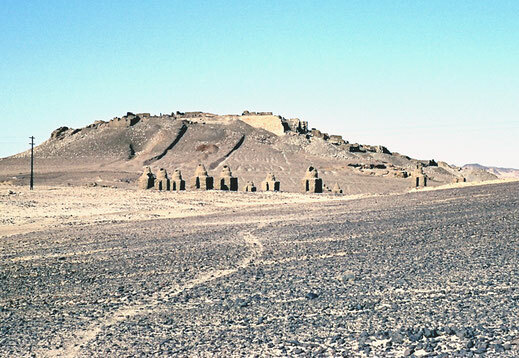 Left side: The southern slope of the Citadel with pottery tent, Dahabiya "Osiris" and our camp site. 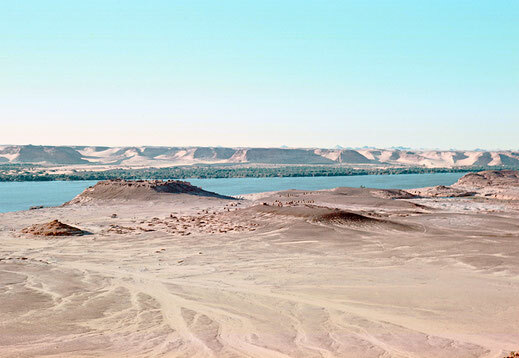 To the right is the southern end of our concession with the eastern ridge of Gebel el-Shams. 1. Map based on old survey notes made by Peter Mayer and Horst Jaritz. 3. Town site southeast: Mud-brick buildings of the Ottoman period. 2. 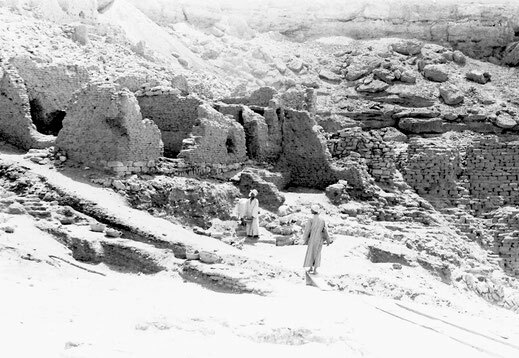 The remains of the late "Christian Palace" before excavation in 1965. According to Nicholas B. Millet: "This vaulted mud-brick complex was built in the thirteenth century, and that it was enlarged in the fourteenth and lasted into the following century as the most pretentious residence at Gebel Adda". 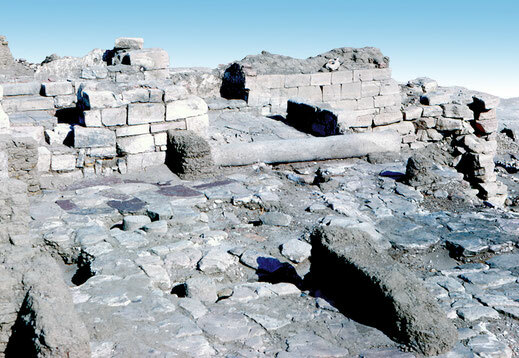 On the northeast side of the "Christian Palace" the remains of Church 7 were found. Exact location not known. 4. Church 4. 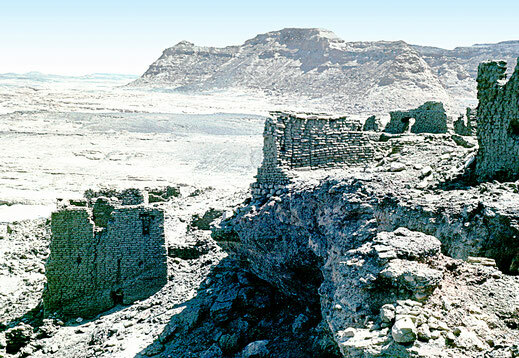 Remaining mud-brick walls at the northern edge of the Citadel. 5. 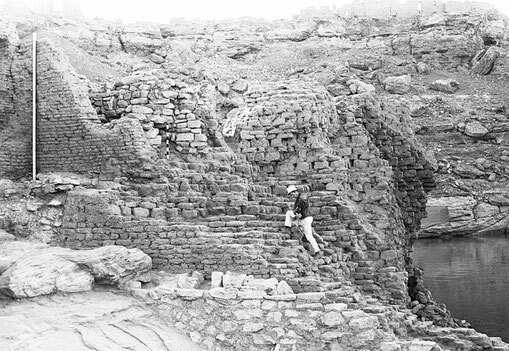 Oriented approximately north-south with the sanctuary in the north, the late Meroitic temple occupied a large area of the northeastern part of the Acropolis.This photograph shows the remains of the well-laid sandstone courses at the northwestern part with a side entrance to the sanctuary room. In a later period this entrance was blocked with mud-bricks of unusual sizes and were of a reddish color, apparently the result of a later fire. Next to it, another stone wall went at a right angle to the other side of the building, leaving in the middle a space for a larger opening to the sanctuary room. 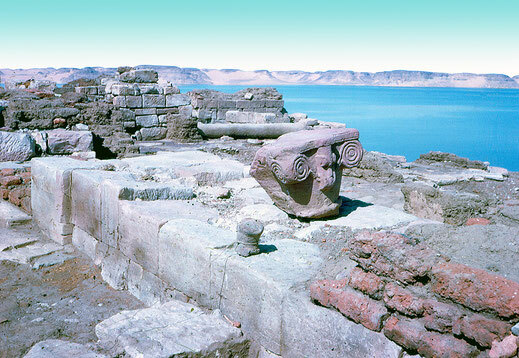 From this wall towards the northern enclosure of the Meroitic Temple, the sanctuary room measured about 11 m. Between the northern enclosure of the temple and the column in front of it, the remains of a rough stone wall of a later date, apparently belonging to Church 5, were found. 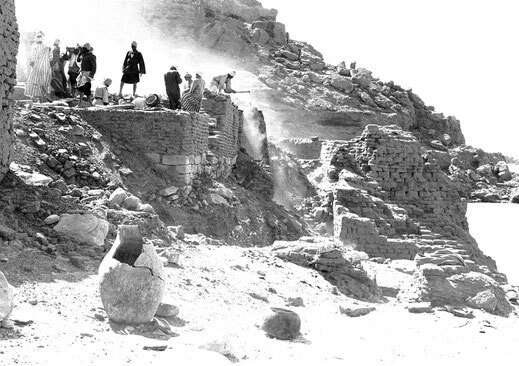 For further information of the Meroitic temple see "Nicholas B. Millet,Gebel Adda Preliminary Report, 1965 - 1966". 6. Rough stone wall of Church 5 built across the sanctuary room. Uneven stone-pavement with traces of mud-brick walls and reused column bases. ( photo by Kent R. Weeks ). 7. Detail of the massive Meroitic stone wall at the eastern side of the sanctuary room. On top of the wall a Christian capital, apparently of Church 5, was found. 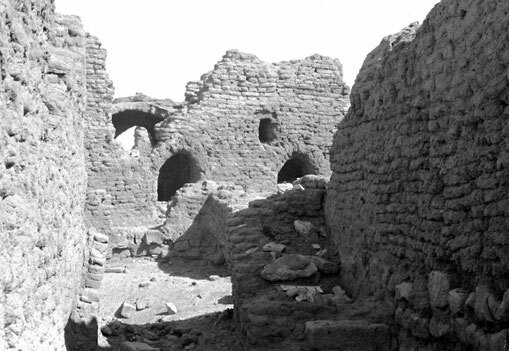 Several layers of burned mud-bricks indicate, that a fire must have discolored the bricks. 8. Just opposite the entrance in the western wall a second entrance, also blocked with discolored reddish mud-bricks, was found in the eastern wall of the sanctuary room. 9. This stamped centerpiece of a bowl of classical Christian ware was found at the town site of Gebel Adda. To my knowledge the location is unknown. Diameter of stamp ca. 1,4 mm. See William Kelly Simpson in The Pennsylvania - Yale Expedition to Egypt, Preliminary Report for 1963: Toshka and Arminna (Nubia). "Among the potsherds from the small church excavated during the previous season were several examples of the centerpiece of a bowl of classical Christian ware with the representation of a crowned head. 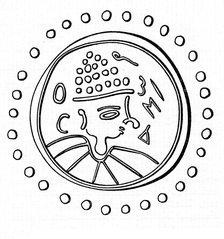 An example of the same stamped centerpiece was found at Gebel Adda according to Nicholas Millet and Reinhard Huber; another example is said to have been found in the excavations of the Oriental Institute south of Abu Simbel, and I have been informed that still another example was found in the excavation of the Department of Antiquities at Aswan in the work conducted by Mr. el Hitta". Another interesting shard fragment was found on the Citadel slope that was identified by Martin Minns as Chinese pottery of the Ming Dynasty. 1. 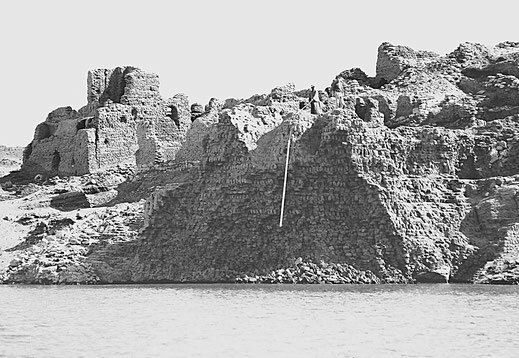 Photograph taken in 1963 before the flood, showing the western slope of the Citadel. 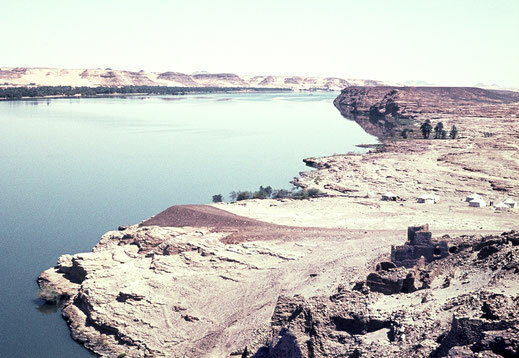 The Northwestern Suburb with the River Tower and the Christian Houses were located above the sandstone plateau to the left. 2. The Northwestern Suburb with Christian House 100, 101,102 and the outline of the inclined River Tower. At this time parts of the First and Second Retaining wall and parts of River Tower were already destroyed by the flood. For details of the X-Group tomb see Number 31and 32. ( Map based on copies of the survey work by Horst Jaritz ). 3. Pit 1. Stone wall 5 ran across the mud-brick walls of Pit1. On the surface of the Pit an unbroken X-Group cup and a grinding Stone was found. In the fill an abundance of X-Group shards and a fragment of an Meroitic amphora with traces of Meroitic inked letters were recorded. According to Nicholas Millet Pit 1 was of the early X-Group period. a few shards of the X-Group and Christian period were found. Pit 3 and Pit 4 were not excavated. 5. 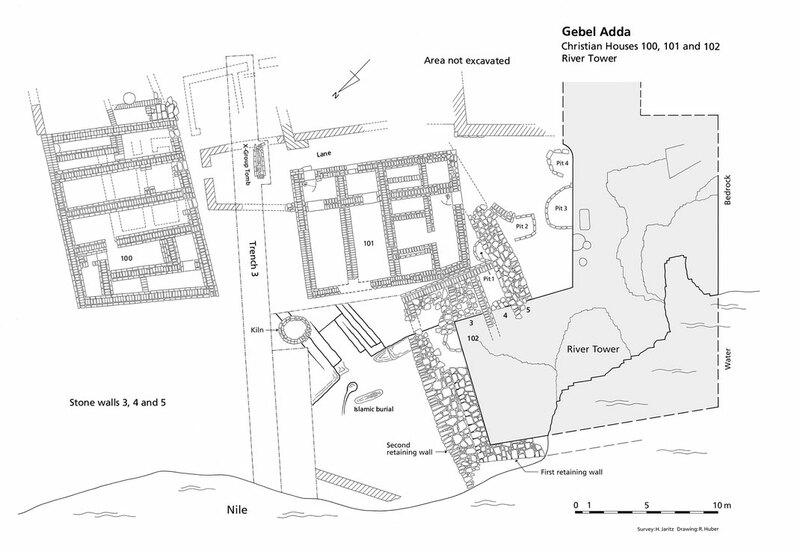 Christian House 100: Plan and sections of the ground and first floors and the underlaying mud-brick structure (left). Beneath the four threshold slaps at the arched entrance to Room 4 a 'foetal pot burial' was placed. Nicholas Millet in Preliminary Report, 1963-1964. 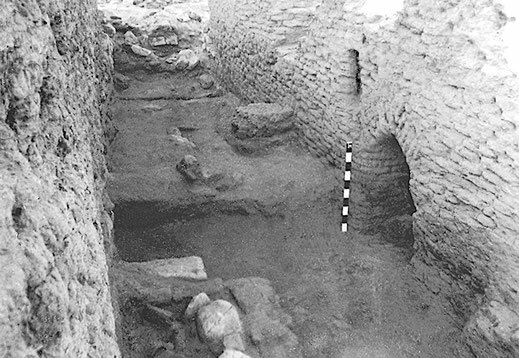 "Two late Christian Houses 100 and 101 are two large Late Christian houses neighboring the River Tower in the north-west corner of the site. 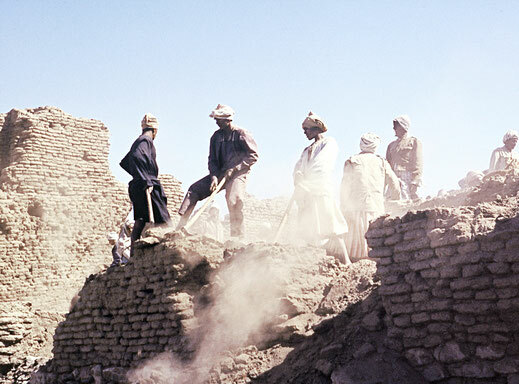 These were excavated an studied from an architectural point of view, but the operations of later squatters had destroyed the original occupational levels. 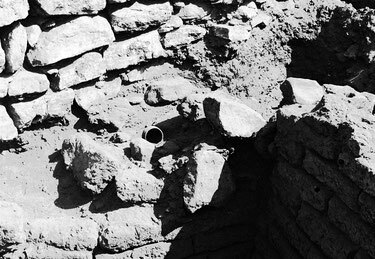 However, both the construction and the rubbish just outside of the house walls indicate a date subsequent to 1000 A.D. Both houses were extensively used in Mameluke and Ottoman times". 7. House 102. Section d-d. Among the other two Christian houses in the River Tower area House 102 was more poorly preserved. 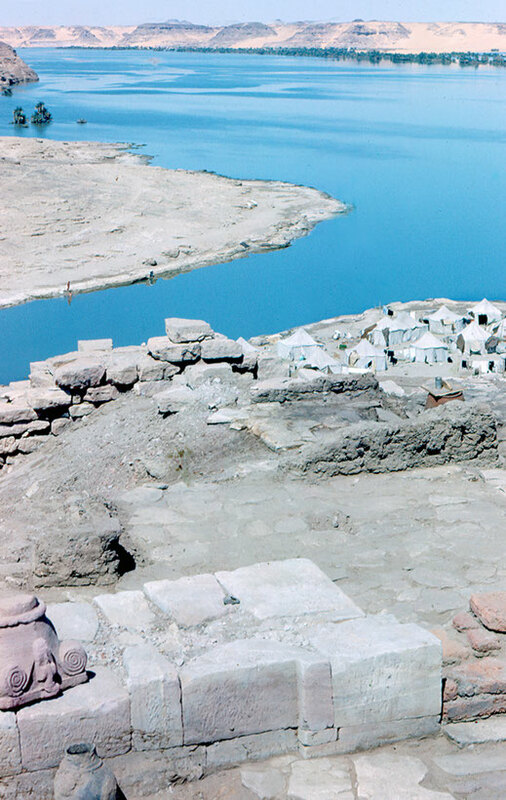 To gain an even walking level mud-bricks of the River Tower and parts of the Stone wall 3 had been removed.The open space was then filled in by stones and rubble to support an even mud floor. For the construction of the house mud-bricks of larger sizes, 420 x 190 x 10 mm, 420 x 220 x 70 mm, were apparently reused from the River Tower. The standard sizes of the other neighboring Christian houses were circa 350 x 150 x 100 mm. On the left side it shows the remains of the mud-brick wall which ran across the Stone wall 3 towards the Stone wall 5. 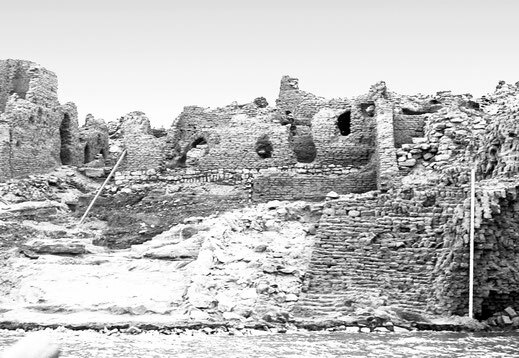 The large mud-brick wall in the center ran at a right angle towards the River Tower. Between this wall and the Stone wall 5, and at the back of it, was only a narrow space for a room with a width of only 1,5 m. No signs of a vaulted roof were found. While excavating House 102 parts of a Meroitic Ba-statue and a Coptic inscription were found in the rubble above the mud floor. Also an Arabic inscription (Reg.1965/1/90) was found from the core of Stone wall 5. 8. Photograph: Detail of the north-eastern corner of the River Tower. Foreground left with a round hole, diameter of ca. 0,65 m with a depth of ca. 0.7 m, was dug out of the sandstone. At its northern side it had an overflow channel. The purpose of the hole is not clear but it can be assumed that it had something to do with water. On the right side it shows the inclined Second Retaining Wall which ran uphill towards the landing of the staircase. 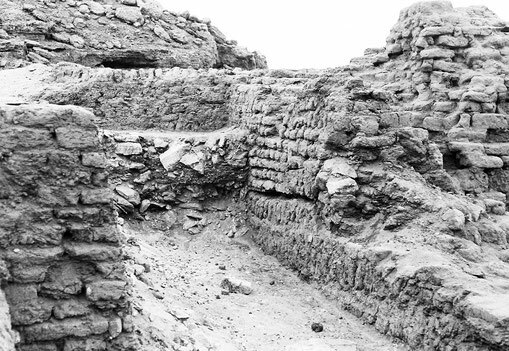 From House 102 in the center only the remains of the eastern and southern mud-brick walls had survived. To the left and at a higher level was the stone foundation and the north-western wall of House 101. 9. 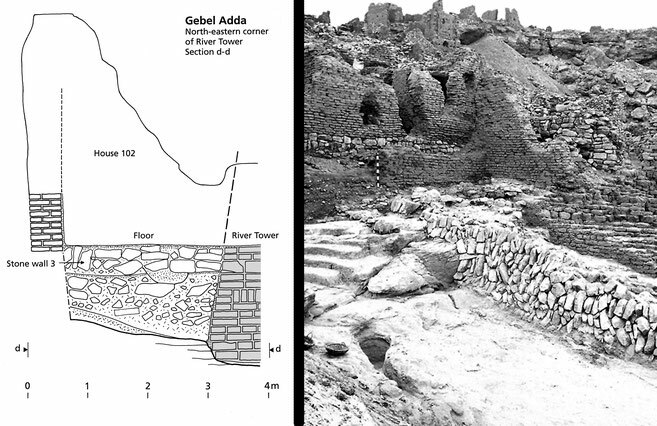 Section a-a: From Trench 3 through Stone wall 5 and the massive mud-brick southern wall of the inclined River Tower. Background with elevation of House 101 and 102. A small shard of the New Kingdom pottery was found in the surface sand by Horst Jaritz in the area above the River Tower. No further shards of this period where found in the following seasons of 1964 - 1965 and 1965 - 1966. See Nicholas B. Millet in Preliminary Report 1963 - 1964. ( Section of the River Tower based on the survey work by Horst Jaritz ). 10. 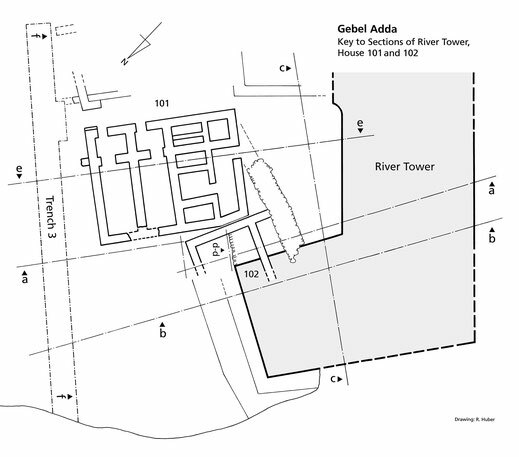 Section b-b: From Trench 3 through the two Retaining Walls and the massive mud-brick structure of the inclined River Tower at the rivers edge. Background with elevations of House 101 and 102. 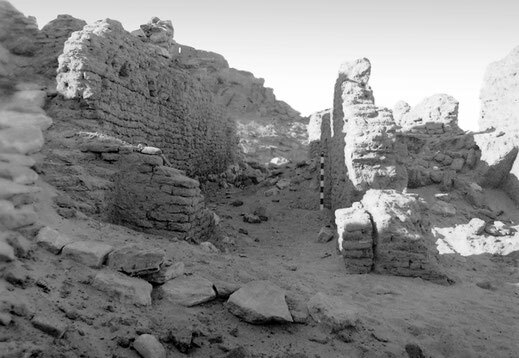 Description by David N. Edwards in "Sudan & Nubia", Bulletin No.20, 2016: "The unusual nature of the brickwork, for which no parallels have yet been found within Nubia, presents a puzzle. 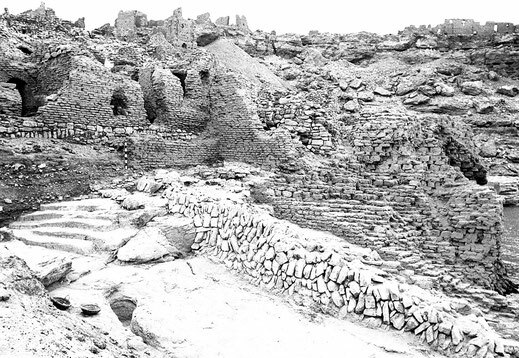 While Millet seemed reasonably convinced that the main period of occupation began in the late Meroitic period, there is certainly reason to suspect that there was some earlier activity on the site, if never really defined in the relatively limited excavations within the settlement". 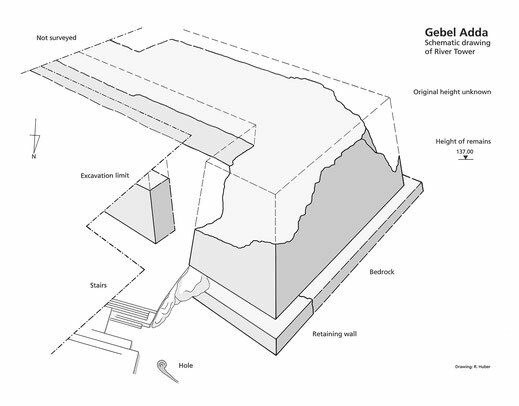 ( Section of the River Tower based on the survey work by Horst Jaritz ). 11. View of the western facade of House 100. 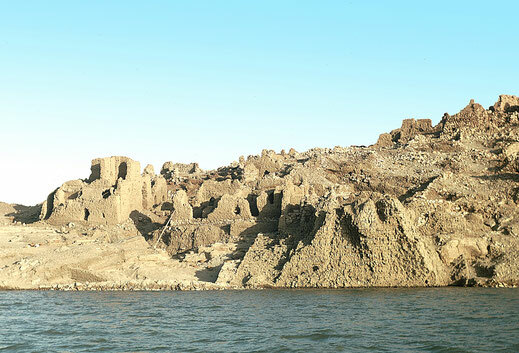 It was the best preserved building of the Christian period in Gebel Adda with the second floor partly intact. Horst Jaritz surveying the building. 12. Southern facade of House 100 with Horst Jaritz in front. 13. 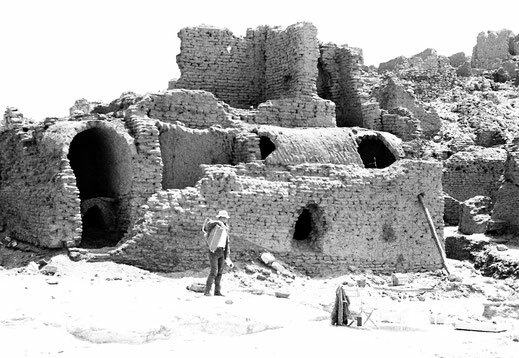 The center of the photograph shows the southern façade of House 100 with arched doorways and remains of the second floor. On the left side of the Lane part of House 101. 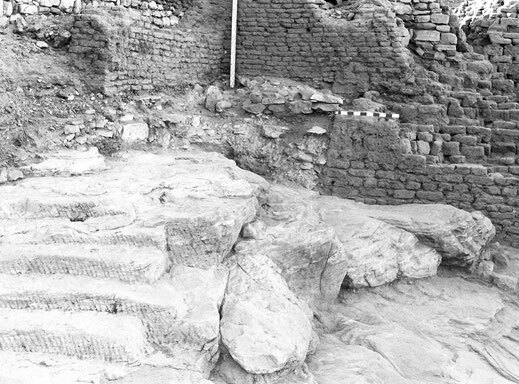 The building to the right side was not excavated. 14. Staircase leading up to the second floor of House 100. 16. Lane: On the right side it shows House 101 with arched doorway and window. 18. Detail of collapsed vaults in House 101. To the right the western passage between House 100 and 101. Behind river Nile and village of Ballana. 20. Trench 3 ran uphill between House 100 on the left and House 101 in the center. On the right side the remains of the inclined River Tower with the stone Retaining Walls 1 and 2. Base of Tower flooded in Season Three. 22. Southern view: Removing House 101. Due to lack of time, we were not able to remove the entire building. In the center it shows the entrance to the inclined River Tower. 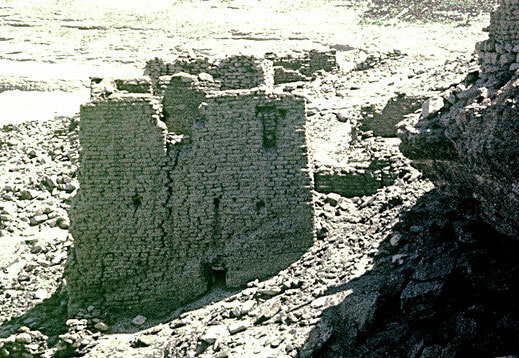 At this time the western part of the Tower had already collapsed. 24. Left side with House 100. View of collapsed River Tower photographed in Season Three. 26. The River Tower in 1963 before the flood. 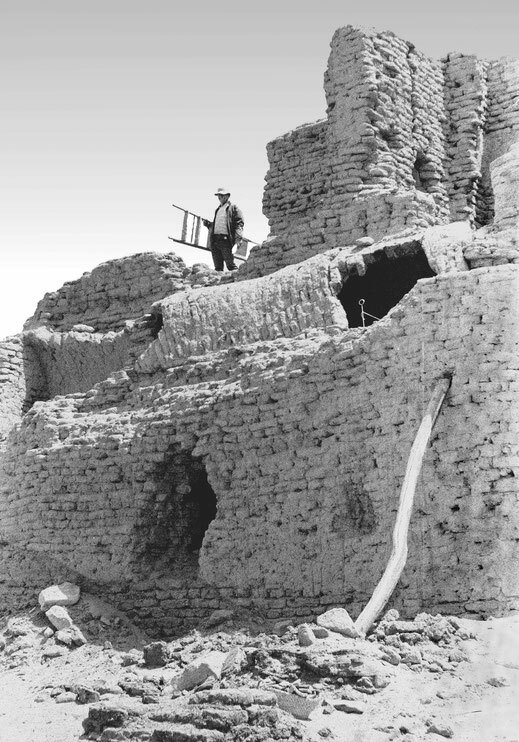 Large mud-bricks, with an average size of ca. 42 x 19 x 10 cm were irregularly laid for the core of the tower. They were placed in horizontal and vertical layers with varying open spaces between them, which must have reduced the stability of the construction. 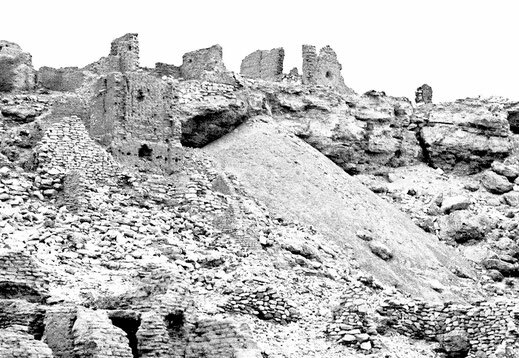 For the façade of the inclined tower the mud-bricks were more precisely placed. ( copied from an old Polaroid picture by Richard Edlund ). 29. View of House 100 and the remains of House 102 built across the River Tower. The inclined Second Retaining Wall was only built with loose stones, without mud-plaster, and ran across the staircase. In front of the opposite staircase a round hole, with some kind of overflow (? ), was dug out of the sandstone. 31. Schematic drawing with staircase leading to the entrance of the River Tower. The other staircase on the opposite side led up to the sandstone level of Trench 3. 33. The "Watch Tower" bellow the northwestern cliff. 35. 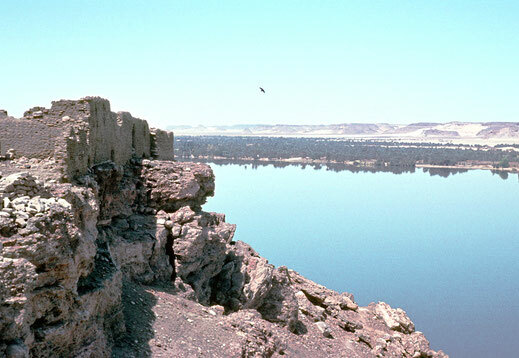 Part of the Northwestern Suburb looking north towards the ridge of Abu Oda with the Rock Shrine of Horemheb. 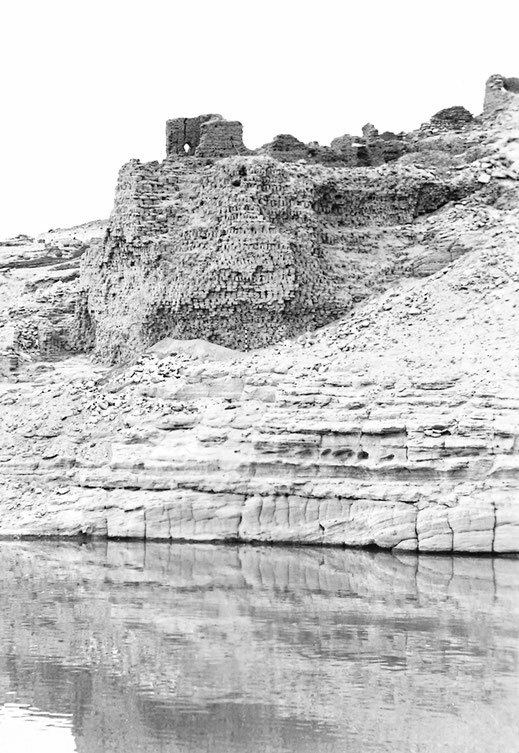 The sandstone plateau at the rivers edge was used for dumping the removed sand and soil from the Tower area. During the third season and to speed up the work, a Decauville railway was installed to transport the debris more efficiently. 15. View of the Lane looking in the opposite direction towards south. On the right side with parts of House 101 during the removal work. 17. Detail of a room with arched doorway in House 101. All vaults had collapsed. 21. Dusty work: Removing House 101. 23. Sandstone staircase leading up to the entrance of the River Tower. The landing was covered with fill material used for the for the foundation of House 102 which was built across the River Tower. 27. River Tower with inclined First Retaining Wall. Here the stones were only held together with mud-plaster. 28. Left: House 102 built across the River Tower with the remains of the First Retaining Wall. At this time a large part of the western façade of the Tower had already collapsed. Our photographer Richard Edlund at work. 30. Entrance to the River Tower. At the end of the short third season and due to lack of time, we where not able to continue our excavation work at the entrance. 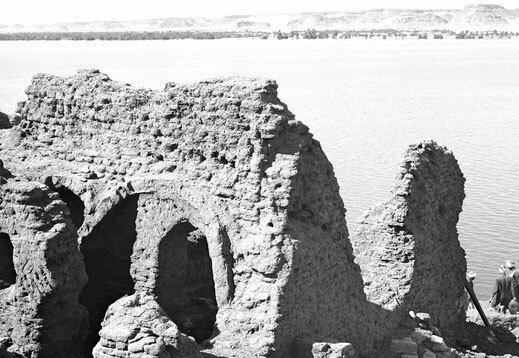 On our return to Gebel Adda, in the last season of 1965 - 1966, a large part of the River Tower was already flooded by the Lake Nasser and had collapsed. Further investigations where not possible. 32. 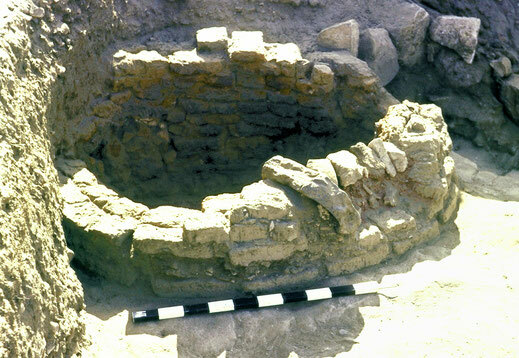 Brick pottery kiln ( 'early X-Group'? ) on the opposite staircase landing northwest of House 101. Inside the kiln a large amount of pottery shards, burned and unburned, were recorded. For the position of the kiln see River Tower map. 34. 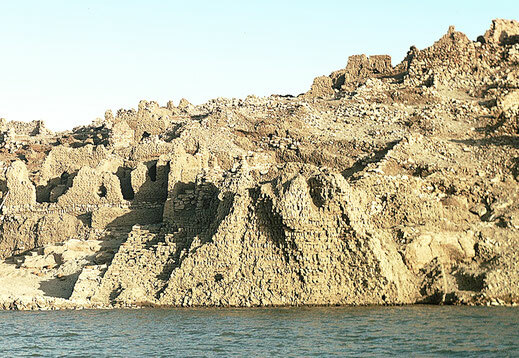 Location of the "Watch Tower" bellow the northwestern cliff of the Citadel. It is not clear if the opening at the base of the Tower led to an additional room or only served as an separate entrance. 36. Enlargement: Southern façade with entrance to the "Watch Tower". The western side of the Tower had partly collapsed. Judging from the height of the building it must have had several floors. I cannot say if this interesting building, of unknown period, was ever investigated. For better identification on the Citadel map, I named it "Watch Tower". 37. Section f-f, shows the southern profile of Trench 3. Indicated in the background are the elevations of House 101, House 102 and the remains of the River Tower. 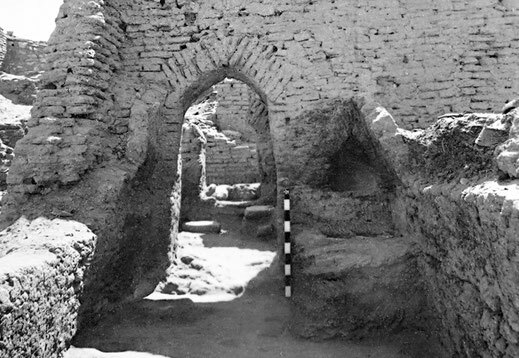 The mud-brick vaulted X-Group Tomb was located about 4.80 m bellow the surface of the Lane. In front of the blocking a jar, still in situ, was placed on a mud-brick pedestal, although the roof of the tomb was destroyed by the robbers. The tomb, placed on loose rocky material, was located about 2 m from an artificially cut sandstone edge. From this edge towards the 30 m mark, several steps where cut out of the sandstone surface. 38. 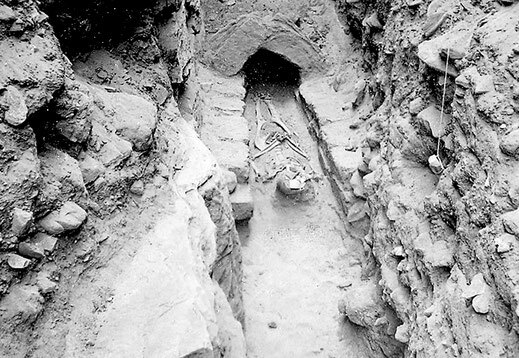 The early X-Group tomb found in Trench 3. 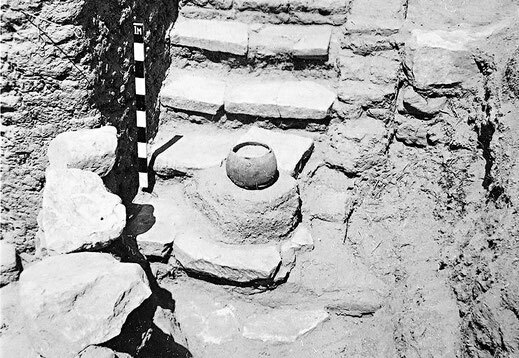 The mud-brick pedestal, blocking and part of the vault was partly removed by the excavator in order to photograph the burial. Position of the burial head oriented north-west and feet south-east. 39. Position of the north-western cross section e-e with profile. 40. Section e-e below House 101 with two trial trenches which went to the natural bedrock. At the left side of the raised natural bed rock formation was an artificially cut out step covered with rubble. Time did not permit for further investigation and it is not clear if here another tomb was placed. On the other side of this rock formation a larger step was cut out to support an early X-Group tomb. In the profile it shows only the foot end of the mud-brick vaulted tomb. Also this tomb was not excavated. Below this step the bedrock, also artificially cut out, continued towards Trench 3. Among the stray finds found on the western slope of the Citadel were cowry shells, beads and pottery shards of different periods. Also small fragments of the so called "Islamic Grenade" were noticed. 41. 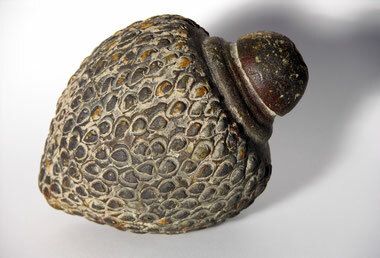 Above object often referred to as "Islamic Grenade". Photographed in Jerusalem in spring 1963. This piece is nearly identical in size, material, form and decoration to many fragments found at Gebel Adda.